The latest leg of the cpjobs.com/JiuJik Career and Education Fair kicked off at Amoy Plaza, Kowloon Bay, on June 19. The four-day event brought together around 60 exhibitors and drew more than 4,200 visitors, who were offered great career opportunities on site. The exhibitors were key players from a wide variety of sectors, ranging from retail, food and beverage, beauty, and telecommunications to logistics, security, finance, insurance, and training and education. They included, among others, Manulife, City’super, Sa Sa, Colourmix, Yoshinoya, Tsui Wah, Watsons, ParknShop, Fortress, Chow Sang Sang, Tom Lee Music and Jardine Aviation Services, who between them provided more than 300 job vacancies. The event also featured a series of well-attended seminars on such diverse topics as career and personal development, the retirement planning market, and how to become a YouTuber. One of the biggest recruitment events in town, the cpjobs.com/JiuJik Career and Education Fair serves as a one-stop platform where companies reach out to potential talents and jobseekers explore career opportunities. Saizeriya, the Italian restaurant chain, is a long-time exhibitor at the event and is constantly looking for new talents to join its fast-growing team. 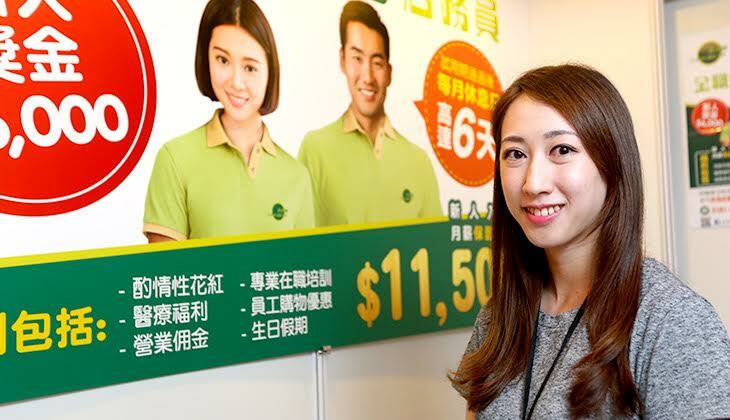 Helen Lai, a recruiter in Saizeriya’s HR department, said that they were aiming to recruit more cashiers, supervisor trainees and management trainees. “Saizeriya is expanding, with five new outlets opening since December, including one at Amoy Plaza, and another two to be unveiled in Chai Wan and San Po Kong later this year. We need more people to fill our positions and assist in growing the company. Our job vacancies are open to anyone with an outgoing personality and an interest in the food and beverage sector,” said Lai. Greendotdot, a first-time exhibitor at the fair, is a retailer of health and organic food products, with an established presence of 25 branches in Hong Kong. Gigi Chan, HR and training manager, said that the company was currently recruiting more shop assistants and area supervisors. “While relevant work experience is valued, it is not a requirement in our frontline roles. What we look for are people with good communication skills and a passion for health and organic food products,” she said. Having worked as a waitress for more than four years, Claire Chen said that she came to the event because she wanted a career change. “Many of my friends have changed jobs or even professions for better pay and working conditions, so I have decided to come and see what is happening in the job market. The fair offers plenty of job opportunities in various sectors and I am all ready to embark on a new career,” she said.